Capreomycin, a polypeptide antibiotic complex of 4 microbiologically active components, is an antituberculosis agent. Capreomycin is used in conjunction with other antituberculosis agents in the treatment of clinical tuberculosis. The American Thoracic Society (ATS), US Centers for Disease Control and Prevention (CDC), and Infectious Diseases Society of America (IDSA) currently recommend several possible multiple-drug regimens for the treatment of culture-positive pulmonary tuberculosis. These regimens have a minimum duration of 6 months (26 weeks), and consist of an initial intensive phase (2 months) and a continuation phase (usually either 4 or 7 months). Capreomycin is considered a second-line antituberculosis agent for use in these regimens. The drug usually is used in the treatment of drug-resistant tuberculosis caused by Mycobacterium tuberculosis known or presumed to be susceptible to the drug. If capreomycin is added as a new drug to a regimen in patients experiencing treatment failure who have proven or suspected drug-resistant tuberculosis, at least 2, preferably 3, new drugs known or expected to be active against the resistant strain should be added at the same time. After results of in vitro susceptibility testing are available, the regimen can be adjusted accordingly. 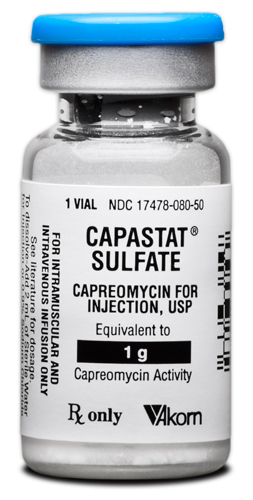 Capreomycin sulfate is administered by deep IM injection into a large muscle mass or by IV infusion. Superficial injections should be avoided since they may be associated with increased pain and the development of sterile abscesses. Capreomycin sulfate injection is reconstituted by adding 2, 2.15, 2.63, 3.3, or 4.3 mL of 0.9% sodium chloride injection or sterile water for injection to the vial labeled as containing 1 g of capreomycin. About 2-3 minutes should be allowed for complete dissolution of the drug. The resulting solutions contain approximately 370, 350, 300, 250, or 200 mg of capreomycin per mL, respectively. For IV infusion, the reconstituted solution of capreomycin sulfate must be diluted further with 100 mL of 0.9% sodium chloride injection and administered over 60 minutes. Dosage of capreomycin sulfate is expressed in terms of capreomycin. In the treatment of clinical tuberculosis, capreomycin should not be given alone. The drug is considered a second-line agent for use in multiple-drug regimens for the treatment of active tuberculosis. Therapy for tuberculosis should be continued long enough to prevent relapse. The minimum duration of treatment currently recommended for patients with culture-positive pulmonary tuberculosis is 6 months (26 weeks), and recommended regimens consist of an initial intensive phase (2 months) and a continuation phase (usually either 4 or 7 months). However, completion of treatment is determined more accurately by the total number of doses and is not based solely on the duration of therapy. For information on general principles of antituberculosis therapy and recommendations regarding specific multiple-drug regimens and duration of therapy. The manufacturer states that the usual adult dosage of capreomycin for use in conjunction with other antituberculosis agents is 1 g IM or IV daily for 60-120 days, followed by 1 g 2-3 times weekly; dosage should not exceed 20 mg/kg daily. The American Thoracic Society (ATS), US Centers for Disease Control and Prevention (CDC), and Infectious Diseases Society of America (IDSA) state that the usual dosage of capreomycin for use in conjunction with other antituberculosis agents in adults and children 15 years of age or older is 15 mg/kg daily (up to 1 g) given as a single daily dose 5-7 times weekly for the first 2-4 months or until culture conversion; dosage can then be reduced to 15 mg/kg daily (up to 1 g) given 2 or 3 times weekly, depending on efficacy of the other drugs in the regimen. However, these experts recommend that adults older than 59 years of age receive a dosage of 10 mg/kg (up to 750 mg) daily. The dosage of capreomycin recommended by the ATC, CDC, IDSA, and American Academy of Pediatrics (AAP) for pediatric patients is 15-30 mg/kg daily (up to 1 g) given once daily or twice weekly. Dosage of capreomycin in patients with renal impairment must be decreased according to the degree of dysfunction and should be based on the patient’s creatinine clearance. The manufacturer recommends that dosage in patients with renal impairment be adjusted to maintain mean steady-state serum capreomycin concentrations of 10 mcg/mL. The manufacturer’s literature should be consulted for specific dosage recommendations for these patients. Nephrotoxicity and ototoxicity are the most serious adverse effects of capreomycin. These effects are most likely to occur in patients with renal impairment, in geriatric patients, and in patients who are receiving other nephrotoxic and/or ototoxic drugs. Renal toxicity may be manifested by tubular necrosis, increases in BUN and nonprotein nitrogen, decreased creatinine clearance, proteinuria, and the presence of casts, erythrocytes, and leukocytes in the urine. The manufacturer states that BUN concentrations increased to greater than 20 mg/dL in 36% of 722 patients receiving capreomycin; BUN concentrations were greater than 30 mg/dL in 10% of patients. There also was depression of PSP excretion and abnormal urine sediment in many patients. Renal toxicity is usually reversible following discontinuation of the drug however, fatal toxic nephritis has occurred rarely. Fatal toxic nephritis was reported in one patient with tuberculosis and portal cirrhosis who had received one month of therapy with capreomycin (1 g daily) in conjunction with aminosalicylic acid; the patient developed renal insufficiency and oliguria and autopsy indicated subsiding acute tubular necrosis. Nephrotoxicity is most closely related to the area under the serum concentration-time curve. Geriatric patients, patients with abnormal renal function or dehydration, and patients receiving other nephrotoxic drugs are at increased risk of developing acute tubular necrosis during capreomycin therapy. Electrolyte disturbances including alkalosis and decreased serum concentrations of potassium, magnesium, and calcium have also occurred because of renal tubular dysfunction in patients receiving capreomycin. Electrolyte disturbances resembling Bartter’s syndrome have been reported in at least one patient. Capreomycin may produce damage to both the auditory and vestibular portions of the eighth cranial nerve. Damage to auditory function may result in a hearing loss. Rarely, permanent deafness has occurred. Headache, tinnitus, and vertigo have occurred rarely from injury to the vestibular branch of the eighth cranial nerve. The manufacturer states that subclinical auditory loss (5- to 10-decibel loss in the 4000-8000 CPS range) was noted in approximately 11% of 722 patients receiving capreomycin; clinically apparent hearing loss occurred in 3% of patients. Some audiometric changes were reversible; hearing loss that was permanent was not progressive following discontinuance of capreomycin. Damage to the auditory and vestibular divisions of the eighth cranial nerve have generally been associated with capreomycin therapy in patients with impaired renal function or dehydration or those receiving other drugs with additive auditory toxicities; these patients often experience dizziness, tinnitus, vertigo, and a loss of high-tone acuity. • Local Effects Capreomycin may cause pain, induration, excessive bleeding, and sterile abscesses at the site of injection. Leukocytosis and leukopenia have been reported, and eosinophilia (greater than 5%) occurs frequently in patients receiving the drug. Eosinophilia usually subsides when the dosage of capreomycin is reduced to 2-3 g weekly. Thrombocytopenia has occurred rarely in patients receiving the drug. Hypersensitivity reactions (including urticaria, photosensitivity, and maculopapular rash), which may be associated with fever, have occurred with capreomycin. Abnormal liver function test results have been reported frequently in patients receiving the drug in conjunction with other antituberculosis agents that are known to cause changes in liver function; the role of capreomycin in producing these abnormalities has not been determined. Serial liver function tests in patients with preexisting hepatic disease receiving capreomycin demonstrated a decrease in BSP excretion without alteration in serum AST (SGOT) or ALT (SGPT) concentrations. Partial neuromuscular blockade, which was enhanced by ether and antagonized by neostigmine, has been reported following large doses of capreomycin. Neuromuscular blockade or respiratory paralysis may occur following rapid IV infusion. In toxicology studies, 2 dogs developed cataracts while receiving capreomycin dosages of 62 and 100 mg/kg daily, respectively, for prolonged periods. Capreomycin is contraindicated in patients hypersensitive to the drug and should be used with caution in patients with a history of allergic reaction, especially to drugs. Capreomycin should be used with extreme caution in patients with renal insufficiency or auditory impairment, and the risk of additional renal impairment or eighth cranial nerve damage should be weighed against the possible benefits of capreomycin therapy. Renal, auditory, and vestibular function should be assessed prior to and at regular intervals during therapy. The manufacturer recommends that renal function be monitored weekly during capreomycin therapy. Capreomycin should be administered in reduced dosage in patients with known or suspected renal impairment. If BUN concentrations rise above 30 mg/dL or there is any other evidence of decreasing renal function (with or without an increase in BUN), the patient should be carefully evaluated and capreomycin dosage should be reduced or the drug discontinued. Because hypokalemia may occur during capreomycin therapy, the manufacturer recommends frequent monitoring of serum potassium concentrations. Hepatic function should be monitored periodically during therapy with the drug. Safe use of capreomycin in children has not been established. Studies have not been performed to date to evaluate the mutagenic or carcinogenic potential of capreomycin. Reproduction studies in rats receiving capreomycin in doses 3.5 times the usual human dosage indicate that the drug may be teratogenic. In teratologic studies, a low incidence of “wavy rib” has been observed in offspring of female rats given 50 mg/kg or more of capreomycin daily. There are no adequate and controlled studies to date using capreomycin in pregnant women, and the drug should be used during pregnancy only if the potential benefits outweigh the potential risks to the fetus. The American Thoracic Society (ATS), US Centers for Disease Control and Prevention (CDC), and Infectious Diseases Society of America (IDSA) state that use of capreomycin should be avoided during pregnancy because of the risk of fetal nephrotoxicity and ototoxicity. Studies have not been performed to date to determine whether or not capreomycin can affect fertility. It is not known whether capreomycin is distributed into human milk. Because many drugs are distributed into milk, the manufacturer recommends that the drug be used with caution in nursing women. Since there is some evidence that nephrotoxic and/or ototoxic effects may be additive, the concurrent or sequential use of capreomycin and other nephrotoxic and/or ototoxic drugs including aminoglycosides, colistin, polymyxin B, and vancomycin should be avoided. Limited information is available on acute overdosage of capreomycin. In general, overdosage may be expected to produce effects that are extensions of the drug’s adverse effects, principally nephrotoxic and ototoxic effects. Hypokalemia, hypocalcemia, hypomagnesemia, and an electrolyte disturbance resembling Bartter’s syndrome have been reported in patients with capreomycin toxicity. Because capreomycin is not appreciably absorbed from the GI tract, acute toxicity would be unlikely following accidental ingestion of the drug. Management of capreomycin overdosage generally involves symptomatic and supportive care. The patient’s airway should be protected and ventilation and perfusion supported. The patient’s vital signs, blood gases, and serum electrolytes should be meticulously monitored and maintained within acceptable limits. In addition, fluid balance and creatinine clearance should be carefully monitored. Patients with normal renal function should be carefully hydrated to maintain a urine output of 3-5 mL/kg per hour. Hemodialysis may enhance elimination of capreomycin from the body, especially in patients with impaired renal function. If capreomycin is ingested, measures to remove unabsorbed drug from the GI tract should be initiated. Use of charcoal may, in many cases, be more effective than use of emesis or gastric lavage and should be considered instead of or in addition to gastric emptying; efforts should be taken to guard the patient’s airway when using gastric emptying or charcoal. The manufacturer recommends that clinicians treating acute overdosage of capreomycin consider contacting a poison control center for the most current information on overdosage of the drug and also consider the possibility of multiple drug overdoses, interaction among drugs, and unusual drug pharmacokinetics in the patient. Mechanism of Action Capreomycin is bacteriostatic in action. The mechanism of action of the drug is not known. Capreomycin is active in vitro and in vivo against Mycobacterium tuberculosis, M. bovis, M. kansasii, and M. avium. At high concentrations, the drug is also active against some gram-positive and gram-negative bacteria. The in vitro susceptibility of mycobacteria to capreomycin depends on the culture media and technique used. In non-egg-containing media (e.g., 7H10, Dubos), the minimum inhibitory concentration (MIC) of capreomycin for most susceptible mycobacteria is 1-25 mcg/mL. When egg-containing media (e.g., Lowenstein-Jensen, ATS) are used, the MIC of capreomycin for most susceptible mycobacteria is 25-50 mcg/mL. Natural and acquired resistance to capreomycin have been demonstrated in vitro and in vivo in strains of M. tuberculosis. In vitro, resistance to the drug develops slowly and in a stepwise manner. Resistant strains of initially susceptible M. tuberculosis develop rapidly if capreomycin is used alone in the treatment of clinical tuberculosis. When capreomycin is combined with other antituberculosis agents in the treatment of the disease, emergence of resistant strains may be delayed or prevented. Frequent cross-resistance occurs between capreomycin and viomycin. Partial cross-resistance has been demonstrated between capreomycin and kanamycin or neomycin. There is no evidence of cross-resistance between capreomycin and other antituberculosis agents currently available in the US. In all studies described in the Pharmacokinetics section, capreomycin was administered as the sulfate salt. Capreomycin sulfate is not appreciably absorbed from the GI tract and therefore must be given parenterally. Following IM administration of a single 1-g dose of capreomycin in healthy adults, peak plasma capreomycin concentrations ranging from 20-47 mcg/mL are attained within 1-2 hours (averaging 28 and 32 mcg/mL at 1 and 2 hours, respectively); plasma concentrations of the drug average 10 mcg/mL at 6 hours and less than 1 mcg/mL at 24 hours. Following administration of a single 1-g dose IM or by IV infusion over 1 hour, the area under the serum concentration-time curve (AUC) was similar for both routes of administration. However, peak serum capreomycin concentrations after IV infusion were 30% higher than those following IM injection. Capreomycin does not distribute into CSF. Information is not available on the distribution of capreomycin into other body tissue or fluids. It is not known if the drug crosses the placenta or is distributed into milk. The plasma half-life of capreomycin in patients with normal renal function is 4-6 hours. Plasma concentrations of capreomycin are higher and the half-life is prolonged in patients with impaired renal function. Capreomycin is excreted mainly unchanged in urine by glomerular filtration. Results of animal studies suggest that small amounts of the drug may also be excreted in bile. Following a single 1-g IM dose of capreomycin in adults with normal renal function, approximately 52% of the dose is excreted in urine within 12 hours. Capreomycin is a polypeptide antibiotic derived from Streptomyces capreolus. The drug is a complex of 4 microbiologically active components, capreomycin IA, IB, IIA, and IIB; the precise chemical structures have not been fully elucidated. Capreomycin is commercially available as the disulfate salt which occurs as a white or practically white, amorphous powder and is freely soluble in water. Capreomycin sulfate sterile powder should be stored at controlled room temperature (15-30°C). Following reconstitution of the sterile powder with 0.9% sodium chloride injection or sterile water for injection, the manufacturer states that capreomycin sulfate solutions may be stored for up to 24 hours at 2-8°C. Solutions of capreomycin sulfate may develop a pale straw color and darken with time; however, this is not associated with loss of potency or development of toxicity.